Flights suspended from 6am this morning, after communication breakdown between City metropolitan airport and Ezeiza international airport. Flights from the Jorge Newbury airport in Buenos Aires City were running with extreme delays this morning, after authorities reported there was a "problem with the communication system." As from around 6am local time, departures were suspended at the metropolitan airport after the system went down. Pablo Biró, head of the aviation union, indicated that the problem was generated from the "fall of the link between Aeroparque [Jorge Newbery] and the Ezeiza International Airport, from where the flights are coordinated." "You can not inform about flight plans and this generates that already the accumulation of passengers at Aeroparque," the union leader told the TN news channel in an interview. 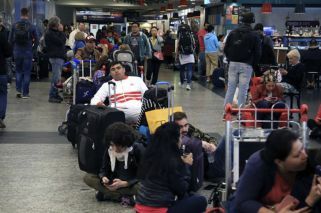 Biró said that arrivals were unaffected, as communication with the control tower of Aeroparque Jorge Newbery was functioning without problems. The union leader, however, used the opportunity to criticise the "lack of investment" at the airport in the capital, explaining that delays were inevitable as only a "a single line of communication" was responsible for air traffic control between the the City airport and the Ezeiza international airport in Buenos Aires Province. The delay comes as key business figures arrives in Buenos Aires ahead of the the B20 summit, which begins today at the Kirchner Cultural Centre. The B20, or 'Business 20,' brings together members of the private sector under the framework of the G20, the presidency of which Argentina currently holds.